Information from the US White House has never reached as many people and with as much velocity as today. How are they doing it and what does it mean for today’s businesses? In addition to radio and television, the WH team is quickly embracing new channels to reach a wider audience. Each of these channels reaches a different segment of audience. Online initiatives range from video to audio, photos and social networks. American citizens can now consume information in print such as newspapers and magazines, on web pages, via RSS feeds, or by podcasts on iTunes. Although many initiatives are recently launched, reception has been remarkably positive. There are no studies yet on the accuracy or amount of information retained. However, if one objective is to reach a younger and more technical savvy community, then the number of subscribers to its many online initiatives is witness to its success thus far (see table below). As a whole, the WH online experience is becoming greater than the sum of its parts. Each initiative is reinforcing another component of the communication strategy. 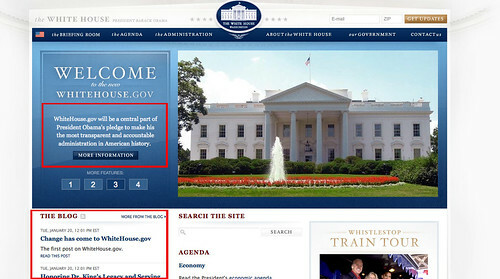 The WhiteHouse.gov website is no longer a destination; it’s a portal to a number of other destinations where more information can be consumed in a different format. Together, these initiatives and others to come are pillars of a unified 21st century communication platform. These online initiatives resonate with a grander technology trend in today’s business environment. For instance, does the current technology movement of unified communications translate to one system from one company? Does “unified” mean all-in-one for simplicity, or plug-and-play for compatibility? Is the “medium” still the message? In a book published in 1964, Marshall McLuhan proposes that the delivery vehicle has an effect on the understanding of the information. Is this still the case in the 21st century? At the end of the day, the White House is connecting with busy professionals and younger Americans. With enabling technologies widely available and the cost of broadcasting falling, what are the lesson for today’s businesses and NGOs? Combined with other initiatives and an open communication environment, the new administration has passed spending plans with remarkable approval ratings from its American citizens. For more inspiration on leadership through information sharing, I recommend the Seth Godin TED talk on Tribe.